Rochester is a city located in Monroe County, New York. The city of Rochester has about 210 000 people, making it the third largest city within the state. 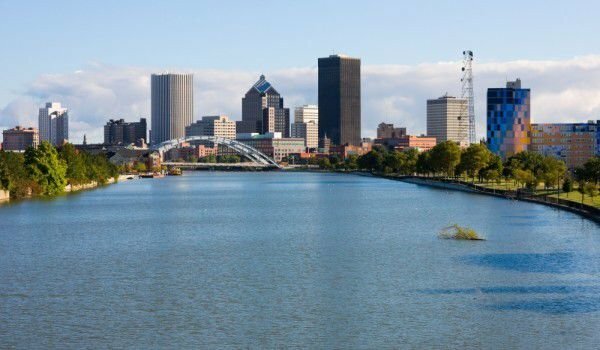 Rochester is recognized as an international center of higher education, but also an international center of medical and technological development. The city houses many famous universities, among them the University of Rochester. In the city are located the headquarters of powerful world companies. The development of the modern city of Rochester carried a violent pace after the American Revolution. At that time, four major Indian tribes were forced to leave New York. In the autumn of 1803, Colonel Nathaniel Rochester and two colleagues, all three natives of Hagerstown, managed to purchase one hundred acres of land near the river Genesee River. They chose the place because the proximity to the river made it convenient for the village. In 1811 its population amounted to fifteen people. In 1817 other landowners joined them, and thus formed the village Rochesterville. In 1842, a bridge was built as an aqueduct of the Erie Canal, which replaced the original bridge from 1823. In 1821 the village Rochesterville was already within Monroe County. In 1823, the village already had a population of two thousand five hundred people and gradually Rochesterville village became known as Rochester. In 1830, the population of Rochester increased to over nine thousand and in 1834, it was recognized as a city. Among the nicknames of the city of Rochester is the “young lion of the West”. In the mid-nineteenth century, Rochester was among the largest producers of flour. At that time the city became a center of popular at that time with children's business centers and nurseries. After the Civil War Rochester felt the expansion of new business ventures. At that time, powerful companies were created, which eventually became world famous giants - such as Kodak and Bausch & Lomb. Kodak sponsored the building of the University of Rochester, and the construction of a music school and other important local institutions. In the early twentieth century, Rochester became a center of industry for the production of modern garments, especially for men. The city was designed for fashion apparel companies, which over time acquired a national and international reputation. Gradually, the city's population grew more and more, it turned into a center of attraction for many people who want to find their luck here. 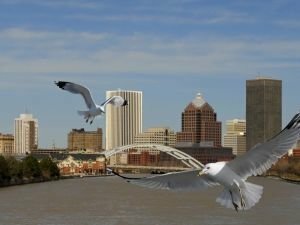 So, in 1870 the population of Rochester amounted to over sixty-two thousand, and in 1950 the population reached over three hundred and thirty thousand people. With the closure of many businesses and jobs in the city, population declined because many families left to seek their fortunes in other areas of the country.